Water parks are the infinitive location for cooling in hot-as-hell summer weather. 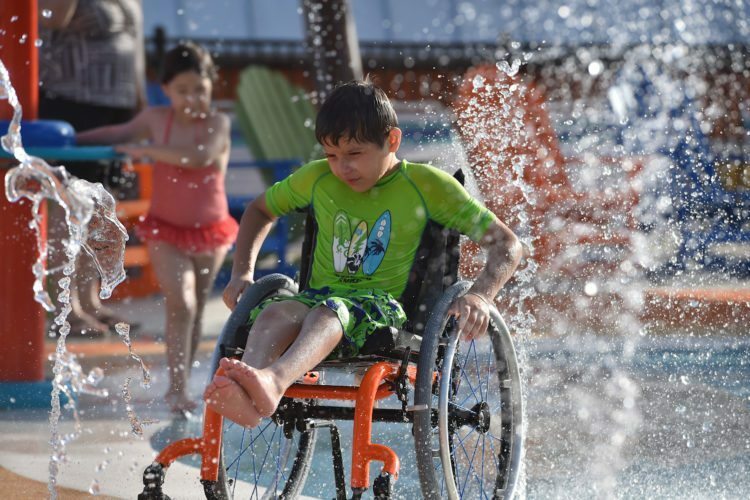 But water parks are also infamous for the lack of accessibility to those with disabilities. A new water park called Morgan’s Inspiration Island was designed for people with a wide range of disability identities- and it’s mind blowing accessible. The park, which opens June 17 in San Antonio, Texas, is fully wheelchair- accessible and hopes to welcome people with disabilities through careful consideration in design. Six major attractions all tropical themed-are located around a seven-story lighthouse. There’s a river boat ride through a jungle setting and five main splash pads, which are more accessible to people with mobility-related disabilities. And notably, anyone with a disability is welcomed into the park for free. “Our goal is to provide a great guest experience in an inclusive, safe, comfortable, not-overly-crowded environment”, park founder Gordon Hartman says. They worked tirelessly with doctors, special education teachers, and water park consultants to produce an all- inclusive design down to every detail- and it really seems like they thought of everything. Some features include high-tech waterproof wristbands (so that parents can easily locate visitors who tend to wander), water that changes temperature, and Pneu Chair, a new lightweight battery-free wheelchair created in partnership with the University of Pittsburgh. At only 80 pounds the Pneu Chairs are propelled by compressed air and just take 10 minutes to “recharge”. The park also provides two wheelchair types- one pushed by a caregiver and a traditional manual one. Park attendance is always limited to ensure a “milder experience”, but there are private “quiet” areas for those who might get overwhelmed in crowds. Tickets are available online to ensure families don’t arrive and are unable to enter due to attendance restrictions. Morgan’s Inspiration Island is located next to its sister theme park, Morgan’s Wonderland- also 25 acres and fully accessible- which opened in March 2010. Both are a part of long list of successful projects fronted by the Gorton Hartman Family Foundation. Hartman stressed in a statement that “like Morgan’s Wonderland, Morgan’s Inspiration Island is not a special-need park; it’s a park of inclusion”. The water park will be open daily throughout the summer until mid-August, and then on weekends in August and September. Additional accessible morgan facilities are currently under-development to add the fun.